Mrs. Shirley A. Nolan, age 77, passed away at her home Saturday evening, August 25, 2018 with her family by her side. She was born in St. Albans July 21, 1941 daughter of the late Delphis and Helen (Champaine) Murray. On September 20, 1958 she married Robert Nolan. Bob predeceased her on May 14, 2003. Shirley was a homemaker caring for her children and family. She enjoyed spending time with her family, bingo, coloring, listening to music, and going on bus trips to the casino with her friends at Four Winds. She was a member of the VFW Auxiliary Unit #758, and the Ladies of St. Anne. She was a lifelong communicant of Holy Angels Church. 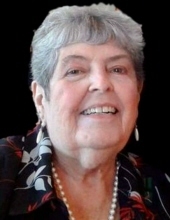 Shirley is survived by her children, Michael Nolan and his wife Shannon of Wallingford, CT, Melissa Machia and her husband Kevin of St. Albans, her grandchildren, Jenny Beth Cook and her husband Josh, Jessica Carswell and her husband Chris, Maria Machia, Kiely Nolan, Amelia Nolan, Gabriel Nolan, Cooper Nolan, her daughter-in-law Cindy Nolan of St. George, and her brother-in-law Gary Balser of Kissimmee, FL. Shirley was predeceased by her parents, her husband Bob, a son Robert Nolan, her sister Gloria Balser, her feline companion Precious, and her special father Harold “Red” Lapan. A Mass of Christian Burial will be celebrated Friday, August 31, 2018 at 10:00 AM in Holy Angels Church. Interment will follow in the Nolan family lot in Mount Calvary Cemetery. The family will receive condolences at the Brady & Levesque Funeral Home, 86 South Main St., from 7:00 PM to 9:00 PM on Thursday. As an alternative to flowers, memorials may be made to the Franklin County Home Health Agency, 3 Home Health Circle, St. Albans, VT 05478. Arrangements are entrusted to the Brady & Levesque Funeral Home where online condolences and memories may be shared with her family and friends at: www.bradyandlevesque.com. To plant a tree in memory of Shirley A. Nolan, please visit our Tribute Store. "Email Address" would like to share the life celebration of Shirley A. Nolan. Click on the "link" to go to share a favorite memory or leave a condolence message for the family.